Still optimistic about the changes that have transformed their country’s politics, most Egyptians offer positive opinions about the key players in the uprising that toppled President Hosni Mubarak. In particular, the military is overwhelmingly popular, as is its chief, Field Marshal Mohamed Tantawi. But Egyptians also give high marks to a disparate set of leaders and groups associated with the demonstrations in Cairo’s Tahrir Square and the efforts to dislodge Mubarak. For instance, both the Muslim Brotherhood and the relatively secular April 6 Movement receive positive reviews. Also, Secretary General of the Arab League – and candidate in the upcoming presidential race – Amr Moussa is extremely well-regarded, with about nine-in-ten Egyptians expressing a positive opinion of him. While views are somewhat more divided toward another leading contender for the presidency, former International Atomic Energy Association (IAEA) head Mohamed ElBaradei, he nonetheless receives a favorable rating from a majority of Egyptians. Overall, most of those surveyed say that religious leaders are having a positive impact on the country, although the topic of religion clearly divides Egyptians. Roughly one-third of Egyptian Muslims say they sympathize with Islamic fundamentalists, roughly a third sympathize with those who disagree with fundamentalists, and the rest decline to choose a side in the ongoing debate about Islamic fundamentalism and its place in Egyptian society. 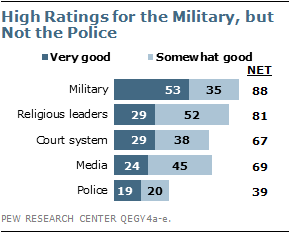 Across all major segments of the Egyptian public, the military receives overwhelmingly positive ratings. Fully 88% of Egyptians say the military is having a good influence on the country, including 53% who believe it is having a very good influence. Views of the military are more positive now than in 2007, when 70% said it was having a positive impact and 30% described the military’s influence as very good. The military is especially popular among poorer Egyptians. Roughly seven-in-ten (69%) lower-income respondents characterize the military’s influence as very good, compared with 48% of those in the middle-income category, and 46% of high-income Egyptians. Women also express more intense support of the military than do men (58% of women compared with 49% of men rate military influence as very good). About eight-in-ten Egyptians (81%) think religious leaders are having a good influence on the country. However, the percentage saying these leaders are having a very good impact has slipped from 43% in 2007 to 29% today. The media and judiciary also receive largely favorable reviews. Roughly seven-in-ten (69%) believe the media – such as television, radio, newspapers and magazines – are having a positive effect. Similarly, 67% say the court system’s influence is positive. Among the institutions tested, the police receive by far the worst ratings. Only 39% of Egyptians say the police are having a good impact, while 61% believe they are having a bad effect on the country. The police are especially unpopular among older Egyptians, the poor, the less educated, and urban dwellers. Among people younger than age 50, about four-in-ten say the police are having a good influence, but only 29% of those 50 and older hold this view. While 48% of the college-educated describe the influence of the police as positive, just 37% of people with a secondary education and 36% of those with at most a primary school education agree. High-income (47% good) and middle-income (46%) Egyptians have a much more favorable impression of the police than those in the low-income category (17%). And Egyptians in rural areas (44%) see the police in a more positive light than those in urban areas (33%). Both the April 6 Movement and the Muslim Brotherhood – two of the highest-profile groups involved with the demonstrations against Mubarak – are broadly popular among the Egyptian public. Three-in-four express a favorable opinion of the Muslim Brotherhood, and 37% have a very favorable opinion of this organization, which has been a major presence in Egyptian society for decades, although it was officially banned from politics throughout the Mubarak era. Support for the Brotherhood is somewhat less intense among lower-income Egyptians (26% very favorable) than among those in middle- (41%) and higher- (43%) income categories. Seven-in-ten Egyptians express a positive opinion of the April 6 Movement, a protest organization formed just three years ago. Even though this group is often associated with the young, technologically savvy protesters in Tahrir Square, it is equally popular among 18-29 year-olds (69% favorable), 30-49 year-olds (69%), and people 50 and older (70%). There are, however, differences among income groups: 57% in the low- income category hold a positive view of the movement, compared with 71% of middle-income respondents and 80% of high-income Egyptians. Individual leaders associated with the overthrow of Mubarak also do well in the ratings. Field Marshal Mohamed Tantawi, current Chairman of the Supreme Council of the Armed Forces, receives especially high marks: 90% have a favorable view of the military leader, including 45% who say they have a very favorable view. Support for Tantawi is particularly strong among lower-income Egyptians, 56% of whom give him a very positive rating. Seven-in-ten Egyptians express a positive opinion of Ayman Nour, a leader of the Al-Ghad Party who was jailed for a number of years during Mubarak’s presidency. Former IAEA chief Mohamed ElBaradei also gets a positive rating from most (57%), although a significant minority (39%) expresses an unfavorable opinion of him. Both Nour and ElBaradei are especially popular among younger people and wealthier respondents. There is no clear consensus about the role of Islamic fundamentalism in Egypt. About three-in-ten Muslim Egyptians (31%) say they tend to sympathize with the Islamic fundamentalists in their country, while 30% sympathize more with those who disagree with Islamic fundamentalists. Four-in-ten do not choose a side. 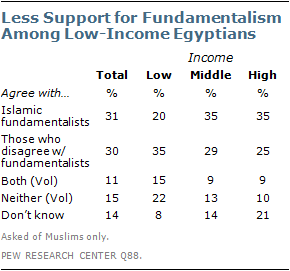 Fundamentalism is less popular among poorer Egyptians – just 20% in the low-income group say they agree with Islamic fundamentalists, while 35% disagree.